All the power to all the people. This article was originally published at ComicBook.Com on October 31, 2014. Valiant Entertainment has made a tradition of treating their 25th issues as a special event. The publisher is still relatively new to the modern comics scene (having only returned to publishing comics in 2012) and 25 is a landmark for any modern series (especially in a market where high quality comics like She-Hulk last only 12). Archer and Armstrongcelebrates this number with a double-sized issue, including two central stories and a plethora of 1-3 page backups. It’s an exciting event and one that is crammed with material showing why this duo has accumulated such a dedicated following. The first comic in the issue is a continuation of the series ongoing story by the monthly team. What makes it work so well is that it is written and drawn to act as both a connecting piece and an opportunity for new readers to catch up. Van Lente’s script acknowledges the past 24 issues and provides some much needed resolution to previous events. It also uses this resolution to reset the series status quo to something new. Archer and Armstrong are moving forward as characters and this story sets the tone for what comes next. The combination of beginnings and endings makes for a slightly uneven story. It functions more as a series of vignettes, each noting something important and then moving on to something completely different. Every sequence works better when judged on its own than when taken as part of a collective whole. The humor and heart that define the series is there throughout every page though and Henry brings forth the aspects that work best in any given moment. There is a one-page splash close to the end where Henry’s composition evokes the series’ new status quo perfectly. Archer and Armstrong are placed in a single moment that feels as though it might go on forever. Their figures and the world around them summarize all of the information necessary to appreciate where the story may lead and why it is worth caring. Layman and Villalobos take their story in a different direction. They opt to spin a more humorous take on the duo without involving the ongoing narrative. Villalobos’ art is the key to this short tale that combines humor and violent antics. Pacing is often the key to both comedy and action, but the manner in which they should be paced can be dramatically different. Villalobos understands how each sequence is meant to play and composes his pages to reflect that. When fists are flying a standard layout focusing on the cause and effect of each action works well. Then the story turns to a humorous beat and he alters the presentation accordingly. On one particularly hilarious page, he parses out information in a series of long horizontal panels. Each of them makes the reader pause and get the joke. By the bottom of the page, I can’t understand how anyone could lack a smile on his or her face. Layman plots the encounter by taking advantage of the series central conceits. Both Archer and Armstrong’s unique traits are on full display as they battle an ancient combatant. Their antagonist is also built from the extended timeline that is the centerpiece to the series. Layman combines those introductory elements and then plants his tongue firmly in his cheek when telling the story. The result is a brief, enjoyable romp that serves as an excellent introduction to Archer and Armstrong. The collection of short stories at the back of the issue is every bit as enjoyable as the two preceding them, if not more so. They are a collection of brief love letters from some outstanding talent. Each story focuses on a specific aspect of Archer and Armstrong, taking an element of the series and drilling into why it is loved. There are examples of the satire, comedy, historical elements, and immense heart that have built the series into a favorite in the Valiant line. Justin Jordan and Rafer Roberts created the three page story “Bar Talk” that stands out as my personal favorite. It’s built around the simple conceit of Armstrong drunkenly talking to historical figures from ancient Sumeria to the future of the Valiant universe. Jordan’s script finds ample opportunities for jokes, some obvious (quoting Shakespeare to Shakespeare) and others cleverer, while also creating a cohesive story commenting on both Armstrong and the ever-turning wheel of time. Roberts is a perfect fit for the content. He makes caricatures of historical settings and personalities so that they are instantly recognizable. The panels manage to be engaging through the use of diverse imagery, despite the same basic composition being applied to each. Roberts’ work would be perfectly at home in Mad Magazine and that’s the sort of tone this story presents so well. It’s also worth noting that David Baron colored both of the longer stories, as well as the short “First Round’s On Me”. His ability to adapt to the work of different artists while maintaining a consistent tone ought to be applauded. Baron has helped to make the world of Archer and Armstrong more colorful in both a literal and metaphorical sense. The series has always enjoyed playing with old concepts and making big, visual jokes. Baron’s colors bring these things to life. Without his work, it is difficult to imagine a velociraptor, martial artist, and robed mass of cultists all belonging in the same space, but they absolutely do in the world he colors. 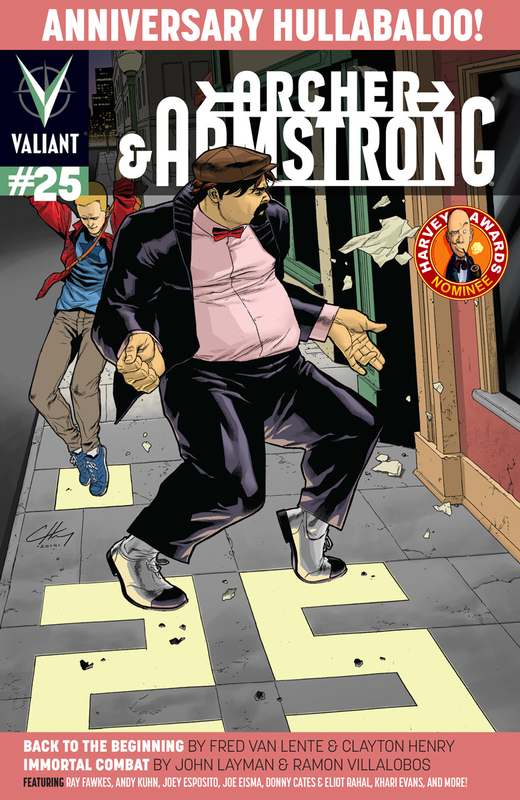 Archer and Armstrong #25 is an anniversary issue done right. It doesn’t just add extra pages and content, but actively seeks to celebrate the material that readers love. Van Lente, Henry, and David make use of their story to touch upon an important moment in the series. They provide longtime fans with a sense of closure, and then raise their expectations for the future. It also leaves the rest of the comic open for a bundle of creative guest stars to do as they please. Readers get exposure to excellent artists and writers that they might not normally see in the Valiant line of comics. It strikes a perfect balance between the ongoing story and the fun of one-and-done tales. There’s a long history of anniversary issues in the world of superhero comics. Archer and Armstrong #25 shows the full potential in creators celebrating the series that fans love to read every month. Magnett Academy, Create a free website or blog at WordPress.com.